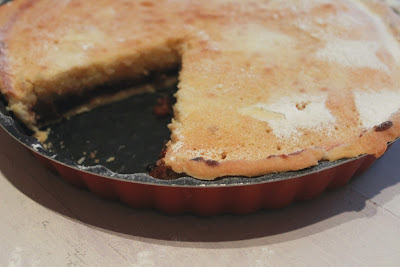 I wasn't going to post any more recipes - & then we ran out of mincemeat whilst I was making a mincemeat, frangipane tart. Necessity is the mother of invention & this is one of the best inventions! Mincemeat has never been this good! Oh yeah...I substituted the missing mincemeat with blueberry jam! You could probably use marmalade but we didn't have any. You could probably use cranberry sauce but we didn't have any. We had blueberry jam & it was incredible!!! You have to try this - it brightens up the taste of the mincemeat & makes it sparkle! Trying to replicate this was tricky, it wasn't exactly an exact formula in the first place. I think I've got it down now so see what you think. Mix the jam & mincemeat, until fully combined. 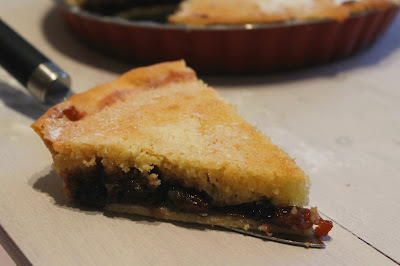 Spread the mincemeat, jam mixture over the bottom of the pie shell. Cream the butter & sugar together. Beat in the eggs until smooth. Mix in the ground almonds, flour & almond extract. Spread the almond mixture over the mincemeat & smooth off the top. Bake at Gas Mark 3 for 25 minutes & then for 5-10 minutes at Gas Mark 6.